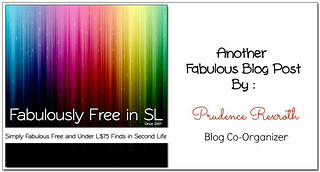 Hello Fabulous Fab Free’rs! Thank you as always for being here. The Ostara’s Altar event just recently started, and part of the event includes a 5 linden hunt. Each of the shops has an Ostara Hunt egg hidden somewhere on the event grounds. The term hidden should be used loosely though, considering many of the shops have placed their egg within plain sight. A few shops also have multiple hunt prizes. Each of these hunt gifts will cost you a mere 5 linden. For this post I picked out three of the many prizes to share with you. I hope you enjoy them as much as I do. Floral Headband – There’s something inherently springtime about flowers in your hair. Since Ostara is in spring, this floral headband by Oubliette makes the perfect accessory. It’s their 5L hunt item at the Ostara’s Altar event. There are no scripts, so it’s also low-lag, and it’s mod so it can be manually sized. Nose Stud – The little spiked nose-stud Pru is wearing is another 5L Ostara’s Altar hunt prize. This one is by Neverwish, and it comes with a silver version, and the “galaxy” version that is shown. This piercing also appears to be free of scripts and can be manually sized. Earrings – I love the delicate look of these gold earrings by PKC which stands for Purrrrfect Kitties Creations. They too are another of the many 5 linden Ostara’s Altar hunt prizes. These earrings do have resize scripts that allow you to custom fit them. The script even includes a poser to help your avatar stand still without the need of a pose stand. 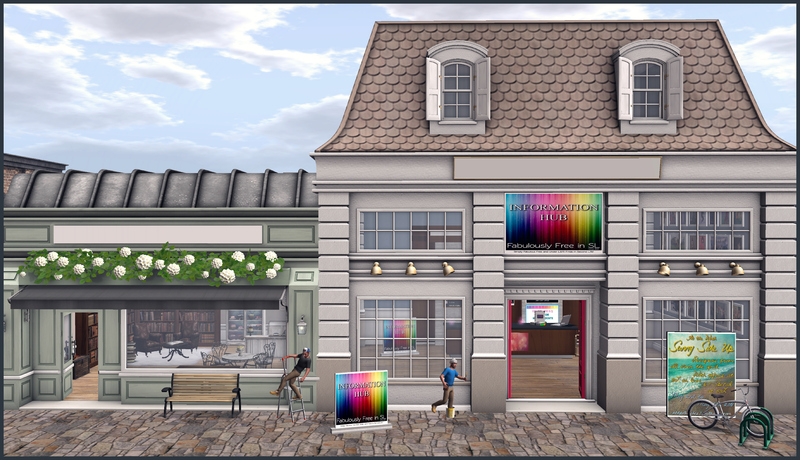 Categories: accessories, classic avatar, events, hunts, jewelry, mesh, other, Piercings | Tags: 5 linden, 5L, 5L Accessories, 5L hunt, 5L Jewelry, Catwa Koura, cheapies, Event Hunt, Exposeur, Exposeur Poses, fab free, fabfree, fabfree in sl, fabulously free in SL, hunt gifts, Hunt in SL, Hunt Prizes, La Frontera, NeverWish, Neverwish Ostara Hut Gift, Ostara's Altar, Ostara's Altar Hunt, Oubliette, Oubliette @Ostara's Altar, Oubliette Ostara Hunt Prize, PKC, PKC Ostara Hunt Prize, Prudence Rexroth, Purrrrfect Kitties Creations, Scond Life Hunts, Second Life, sl, sl hunt, The Ivory Rose, The Ivory Rose Tattoos, TRUTH, TRUTH VIP Joy | Permalink. Hello Fab Free’rs! I’ve packed up all I own, and I’ve got my camera. I’m ready for a long vacation, where are we going? I’d love nothing more than to be able to pack up and go on some long adventure. For now I’ll be satisfied doing my adventuring, and most of my shopping, right here in Second Life. I put together most of this look using current or previous group gifts. As always I’ll let you know all the information about how to get each one, just keep reading! The Hair – The cute little bob hairstyle Pru is sporting is a still available May group gift at Besom. I checked there today, just to be sure. I love the slightly tousled look of this perfect-for-summer hairstyle. 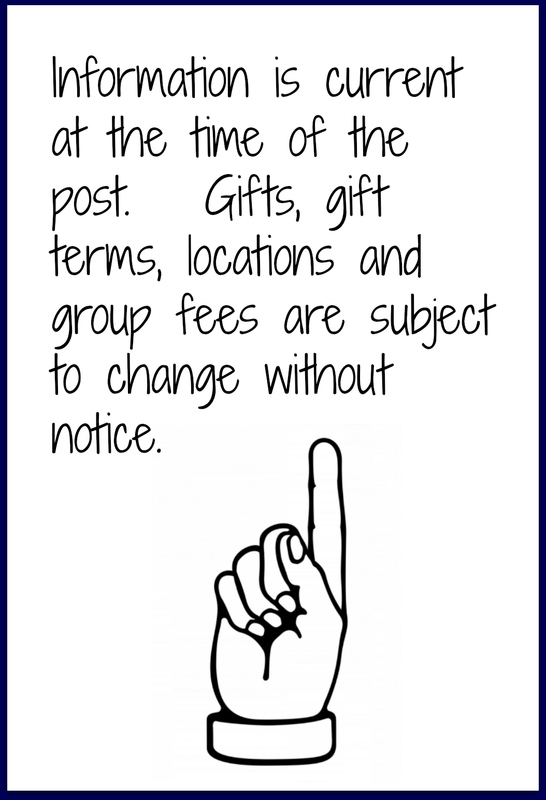 The Besom group is 199 linden to join, and there is more than one group gift currently available. The Dress – This dress from Prey has the look of a structured well tailored leather dress, and the fringe just adds to the effect. It is the sort of dress you could dress up, but there’s no dressing this one down! It also happens to be the free July group gift at Prey. Love told me about it and I’m super pleased she did. The Prey group is free to join, and they also have a male gift available. The Shoes – Pure Poison recently put out this beautiful pair of black heels out as a free group gift. These shoes are absolutely gorgeous on. The Pure Poison group is free to join, so no reason to miss out on these beauties. **Photo Props by Focus Poses. The suitcases and photography equipment are all the “packaging” some of the Focus Poses items come in. Categories: accessories, dress, Free, group gifts, hair, mesh, shoes | Tags: Belleza Shoes, Besom, Besom Group Gift, Catwa, Essences, Essences Blake, Fashion Freebie, Focus Poses, Focus Poses Packaging, free, Free Clothes in SL, free fashion, free group gift, free group join, Free Hair, free in sl, Free Shoes, Free Shoes in SL, freebie, Freebie Fashion Blog, Group Gift Dress, group gift hair, Group Gift Sunglasses, K9, Kustom 9, kustom9, maitreya, Maitreya Lara, Maitreya Shoes, Nexor, Nexor Group Gift, Prey, Prey Group Gift, Prudence Rexroth, Pure Poison, Pure Poison Group Gift, Second Life, Second Life Freebie Blog, Second Life Freebies, Signature Poses, sl, SL Fashion Blog, sl freebie, SLink Shoes, Speakeasy, Speakeasy tattoo, The Ivory Rose, The Ivory Rose Tattoos, zenith, Zenith Gacha | Permalink. Hello again Fab Free’rs. I’m happy to see you. Truth be told I couldn’t think of a better way for this would be mermaid to spend the afternoon than floating in the cool of the pool under the shade of a palm tree. Speaking of mermaids, the Makeover Room gift from Entice is very mermaid-y. I know that’s not a word, but I couldn’t find a better way to describe this cute gift. Also, I found the perfect summery pink pout at Pout!. I went ahead and included the vendor ads for each of these free gifts so you can see the colors and options. Keep reading for the where and the how. The Dress – Honestly, I’m not sure if this blue and purple gradient little dress with the pretty scalloped edges is a dress, a swimsuit cover, or what, but I like it a lot. Wear it how you please, this versatile gift is a free gift for Makeover Room group members. In addition to this pretty one-piece version, there is a two piece bikini style top and skirt version. Both are equally cute and equally revealing, especially the skirt. This free Makeover Room group gift from Entice comes in several sizes. To get yours head over to the Makeover Room and join the free-to-join Makeover Room group. The gift is waiting at the entrance to the event space. The Pout – Where else but Pout! would have just the right pink lipstick applier?! Pout! has a lipstick applier set as their current group gift (there are past gifts also available for 1 linden). The free “Bubble pop” lipstick set has 5 lip colors in several applier options. The Pout! 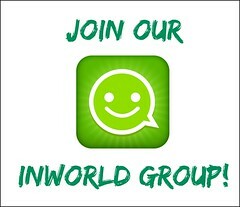 group is free to join at this time. You’ll find the Pout! group gift to the left as you enter the store. Categories: appliers, dress, events, Free, group gifts, groups, makeup, mesh, skirt | Tags: Belleza Freya, Belleza Isis, Bubble pop Lipstick, Catwa, Catwa Applier, Catwa Koura, Entice, Entice Makeover Room Gift, Essences, Essences Aura, fab free, Fab Free in SL, fabfree, fabfree in sl, fabulously free in SL, Fashion Freebie, Focus Poses, Focus Poses Backdrop, free, Free Clothes in SL, free fashion, Free Fashion in SL, free group gift, Free Group Gifts, free group join, free in sl, Free Lipstick, free makeup, free stuff SL, gifts, gifts in SL, Kotte, LAQ Applier, Lelutka Applier, lipstick, Maitreya Lara, Makeover Room Group Gift, Makevoer Room, mermaid, mermaid fashion, pout!, Pout! Group Gift, Prudence Rexroth, Second Life, Second Life Freebie, sl, SL Fashion Blog, sl freebie, sl freebie blog, Slink Hourglass, SpellBound, summer, summer fashion, summer in Second Life, The Ivory Rose, The Ivory Rose Tattoos, Vista Applier, What Next? | Permalink. Hi hi Fab Free’rs! What do you do when it’s 3am and you can’t sleep? Get out the chocolate, make some coffee, and binge watch something on Netflix. That’s what I do anyway. I also might do a little hunting in Second Life. Just recently the Sweet & Sour Hunt began, and there are several great shops participating. The Sweet & Sour Hunt is a dollarbie (1 linden) hunt which will run through July 15th. I picked up a couple of the prizes and am excited to share two of them with you today. All things considered this dollarbie Sweet & Sour Hunt prize from X.T.C. Poses couldn’t be more perfect for someone like me. Aptly named “Netflix n …Chocolate” this pose is one of two Sweet & Sour Hunt prizes at X.T.C. Poses. This pose includes the coffee and chocolate along with the static pose for just 1 linden. That’s a steal of a deal if you ask me! Trashed is also participating in the dollarbie Sweet & Sour Hunt. Their hunt prize is this cute bandeau style mesh top. The dollarbie top from Trashed comes in a few sizes in the single blue/grey color shown. Categories: accessories, dollarbie (1L-3L), hunts, mesh, other, poses, shirt | Tags: $1 linden, 1L hunt, Catwa Koura, cheapies, Chocolate, coffee, dollarbie fashion, dollarbie hunt, Dollarbie Pose, Dollarbie Top, Essences, fab free, Fab Free in SL, fabfree, fabfree in sl, fabulously free in SL, Fashion Blog, Fashion in SL, female fashion, Hunt in SL, hunt prize, Ikon, Ikon Eyes, IR, K9, Kustom 9, kustom9, Maitreya Lara, Netflix and Chocolate, pose props, Pose with Props, Prudence Rexroth, Second Life, sl, SL Dollarbies, SL Fashion Blog, sl hunt, SSH, Sweet & Sour Hunt, Sweet & Sour Hunt Prizes, Sweet and Sour Hunt, The Ivory Rose, The Ivory Rose Tattoos, Trashed, Trashed Sweet & Sour Hunt Prize, Wasabi Pills, X.T.C., X.T.C. Poses, X.T.C. 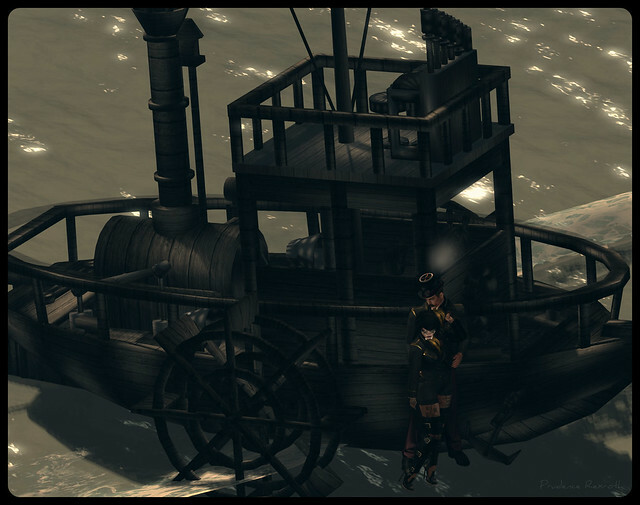 SS Hunt Prize, XTC, XTC Poses | Permalink. 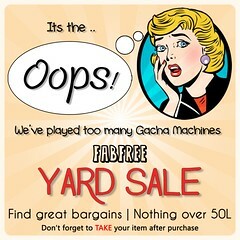 Hey There Fab Free’rs! Happy Monday. If you’re looking for a little freebie retail therapy, I suggest heading over to Osmia. Just recently Osmia celebrated their first birthday, and they put out this super cute bodysuit out as a free birthday gift for their group members. There are also a few other past group gifts still available. The Osmia group is free to join. The bodysuit comes in a few mesh sizes and includes a color change hud with quite a few solid color options. 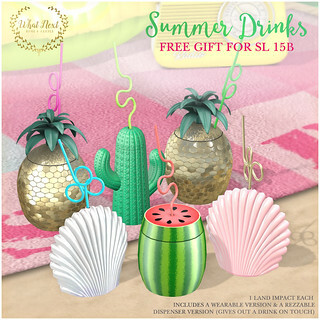 Categories: Free, group gifts, mesh, other, shirt, swimwear | Tags: $0L, 0 linden, bodysuit, Catwa Koura, Essences Aura, fab free, Fab Free in SL, fabfree, fabfree in sl, fabulously free in SL, Fashion Freebie, Fashion in SL, free, Free Birthday Gift, Free Bodysuit in SL, Free Clothes in SL, Free Clothing in SL, free fashion, free gift, free group gift, free group join, free in sl, freebie, group gift sl, IR, K9, Kirin, Kirin Poses, Kustom 9, kustom9, Maitreya Lara, Osmia, Osmia Birthday Gift, Osmia Group Gift, Prudence Rexroth, Runaway, RunAway Hair, Second Life, SL Fashion Blog, The Ivory Rose, The Ivory Rose Tattoos, Virtual Fashion | Permalink.